After finding our first geocache Sunday morning, we continued hiking up the trail along Rifle Creek. This tributary had to be crossed. Someone conveniently placed stepping stones across the water for those of us who don’t like wet feet. 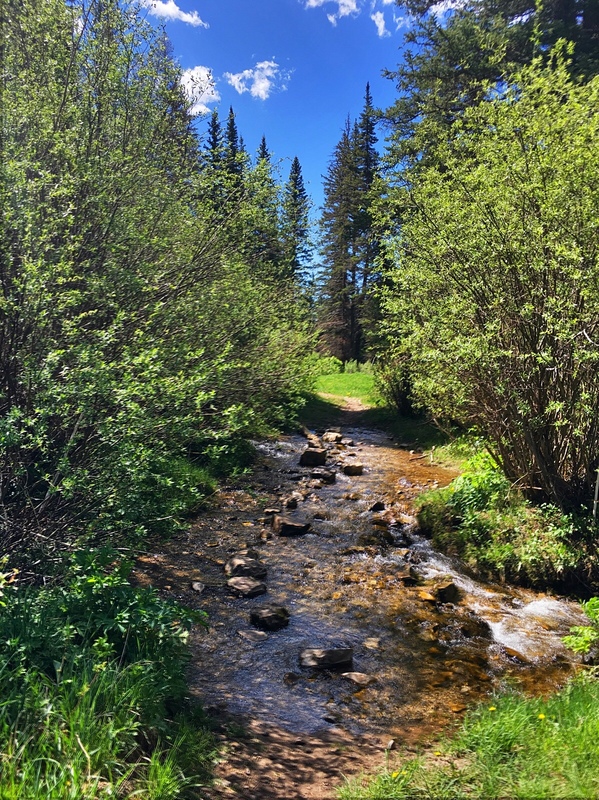 Yesterday’s outing to Rifle Creek and the Three Forks trail was very good for me. I decided to go find a geocache located a quarter-mile from the trailhead, loaded that location (and a few others) into my GPSr, and we headed out. The drive out was healing, moving at a modest velocity so the windows could be down and we could take in the glorious morning air. We drove up to the trailhead, past many rock climbers. There were so many rock climbers out there that there was no parking. I would have stopped to make some images of them working (and find a geocache) had I found a place to park. We got out of the rig and the Girl started sniffing about, as usual. I met another old guy who was perched on top of his RV. We chatted a few minutes and I gather that he works on telecommunications. My gut feeling is that he’s a network engineer of some kind, but I never got clarity on that. Saying goodbye, the Girl and I headed upstream. The water in Rifle Creek burbles along its path here. The water sound was musical and refreshing. The sound of the wind in the fir and spruce trees sussurated comfortingly. I listened for critters as walked. The Girl stayed fairly close after so many days on lead. I found the geocache without too much trouble, pawed through the contents in case there was a travel bug or other trackable (no joy), signed the log, and buttoned up the container. Instead of turning around, we continued our path upstream. It was simply too beautiful to return to the motel room without more time in the field. So we hiked another half-hour, me mistakenly thinking I needed to be out of the park by noon. (I had a day pass from the State Park that expired at noon. We were on Forest Service land; not State.) On the back, I picked a nice shady spot to rest and did my meditation regimen. The Girl stayed pretty close, there being many things to sniff. Being outdoors for a meditation was very nice and is something I should do more often. We turned around and headed back downstream toward the rig. The sky had a few puffy clouds and we had intermittent periods of sun and shade. It was warm, but not hot. It was nearly a perfect day. I paused at the stepping stones on the way back. The life metaphor of the stones in the clear, talkative water struck me as I stood there, listening to the water, listening to the Girl being a dog, and listened to the winds speak in the evergreens. I appreciate those stones, literally and metaphorically, even if I sometimes slip and get my feet wet anyway. (I did.) Although we humans like to think we know where we are going in this thread of time called life, we don’t really know. Life changes, sometimes drastically over a short period of time. The plans we make often do not work out, sometimes because the plans were faulty (unforeseens) and sometimes because we change and the plans are no longer appropriate. It doesn’t really matter, I think. Don’t get me wrong; plans are important. It’s good to have goals and measure progress toward those goals. However, life is more than plans and goals. It’s a journey I’m on and a part of that journey is to touch the lives of those people I encounter as well as have my own life touched by others I encounter along the way. There is learning and ministry that is part of this process. That’s important. So, with that reflection, I’m going to ready myself for some travel today. The Girl and I are going to make an easy day of it, geocaching and playing outdoors along the way to Green River, Utah. We’ll spend a night there, or maybe two if there are interesting things to see there. Then we’ll move on towards western Nevada. This time I’m going to stop at the Great Basin National Park. I’ve meant to stop there a number of times and never have. This time I’m going to.